When you have the required keys and tokens you can check whether the user is following another user in twitter by using the Twitter API. I am using TweetSharp c# library to perform this task. I have tried with below code and worked for me. If you ever want to do it, try using below code segment. Now you have the required object and you check it using below condition. Found this console for windows. It is a combination of ConEmu and Clink. This is a portable application and need to add into our PATH( not mandatory). With the full version, you have git for windows installed. So just download, unzip and run. We can add custom themes for cmder. This support multiple tabs with different users. If you are working with vs code, you can integrate cmder as the terminal. You can downlod cmder from here. There are many places over the internet which describe and explain this in details. I thought to gather few of them into one place. This is a part of the web storage API. Store data as key value pairs. Can share between sub domains. Store data in user’s browser and can be inspected by developer tools. Large amounts of data can be stored locally, without affecting website performance. Information will never transferred into the server. From all pages can store and access data. Support up to 10MB storage for most of modern browsers. Get cleared after page session ends. Opening page in different tab or window cause a new session to be initiated. Expire after browser or tab closed. Let’s think we want to bind an ajax spinner into kendo grid data Source before and after calling the request. Here is how we do it. I have an kendo grid names as grid. Now with jQuery I am going to bind two events into grid’d data source. So when you call data source like below, it will automatically display your ajax spinner. 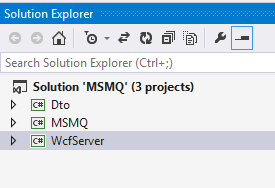 Today I am going to show you how use Message Queuing (MSMQ) with Windows Communication Foundation (WCF). Message queue comes to show in different reasons like decoupling processes , ordering the process, handle bulk messages. Writing an message into MSMQ is not a different, but processing the messages with effective ways is the challenge. As an example we had a problem which delay of sending emails and SMS from our side. Later when we were investigating the issue, we found that we were taking all messages and try to iterate at once. This solution can be used to prevent kind of scenarios. Hope you guys have installed the MSMQ before starting the development. So first create an empty solution and add two console projects. In my solution I have added three projects. Dto project contains this class. Please be kind to adjust the code per your requirement. Here I want to add more and more messages into message queue quickly. Run the project and see whether you have messages in your queue or not. Please see the below images of my queue. Now we have messages in out queue and need to read this messages. My requirement is when I receive a new message into queue, without looking into queue, automatically read method should be fired like a trigger. and implemented class like below. Above method will be triggered from the MSMQ. 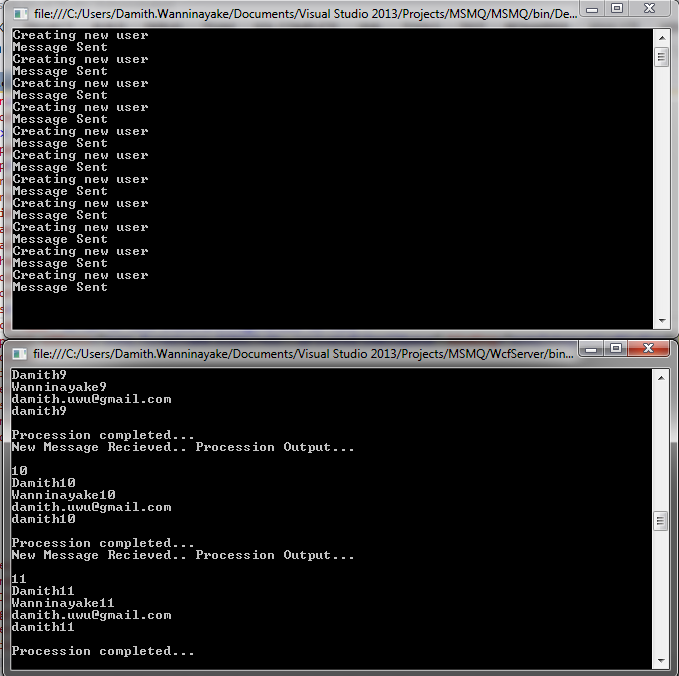 But we have to create a Service host to run this wcf service since we are not using the IIS server. Console.WriteLine("Faulted! "); // Change to something more sensible – this is just an example showing what happens when the host has faulted. Let’s see the config file which has end point and other configuarations. All set. We need to run the application now. You can adjust the thread sleep time and check the speed of the reading process. Recently wen automation is one of popular area and it is good to know about it. 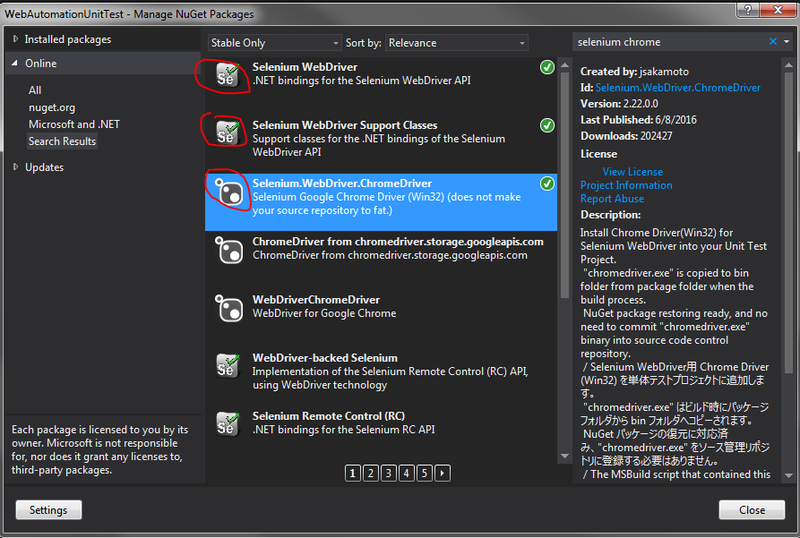 Today i am going to show you how to automate testing with Selenium web driver. 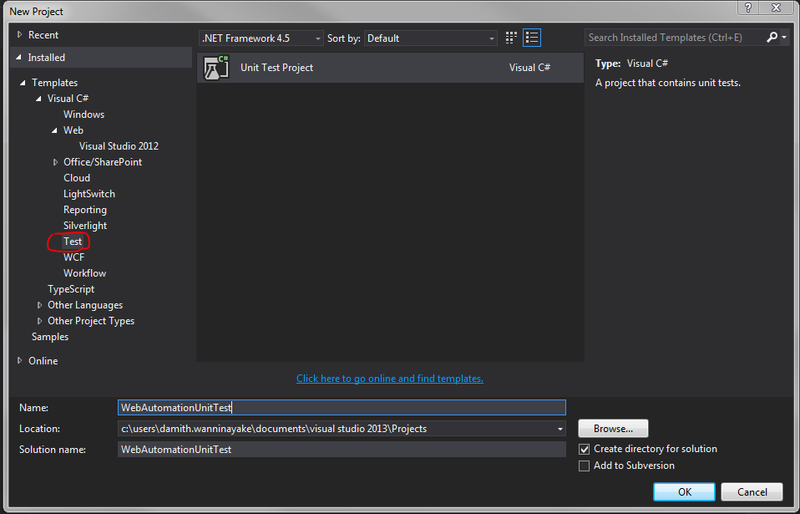 I am using visual studio 2013 professional. Step 03: Let’s add one html file. We can use this file to test. But in real world scenarios, we have to use QA server URL. For demo purpose I will use static html file. 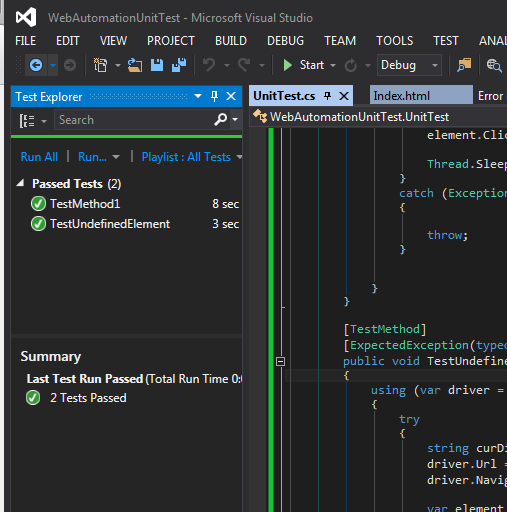 Now we will two methods into out unit testing class. And lets run the test cases. OK. Lets say there is a element which will load by ajax. In that case we have to wait until the element is visible. In this king of scenario you have to use WebDriverWait option. 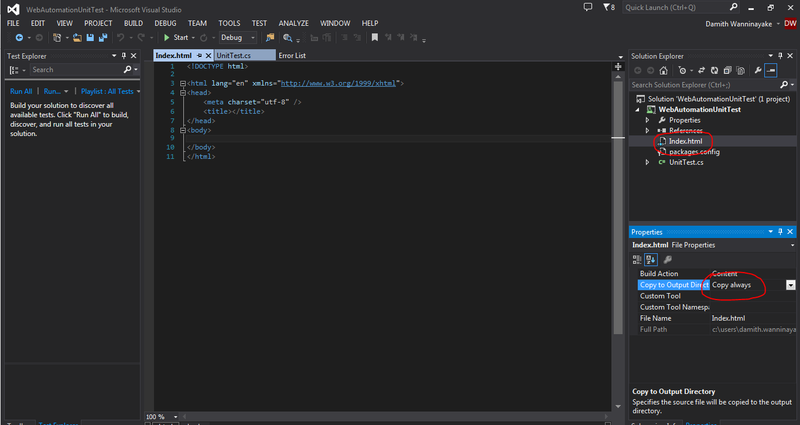 I have created a sample project to read json file, edit and save into another file using c# and Newtonsoft.Json library. If anyone want this kind of implementation, you can download project and continue. I have added the sample json file with the project into my Github repository. 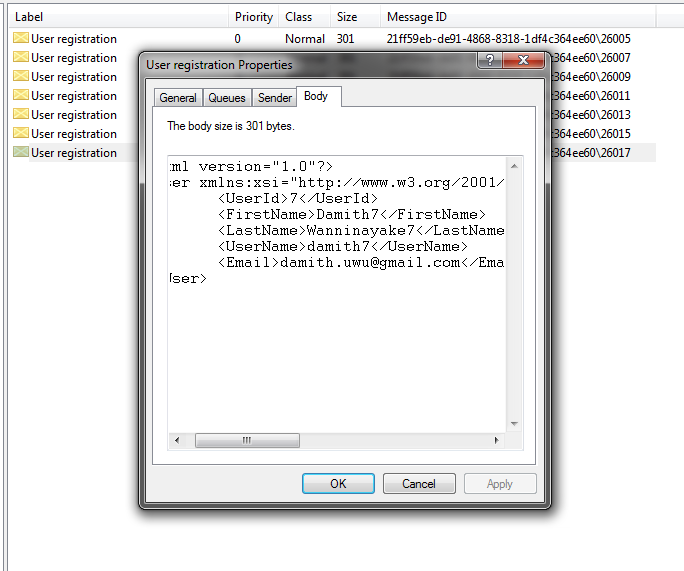 I have json file format like below. According to that json structure, i am going to build my object structure like below. And I have Tasks class which contains list of Task classes. This is how program going to read the json file and convert into list and bind into grid. And convert grid data into json file. Please download the project and use it in your projects. You have to add exception handling into this project. 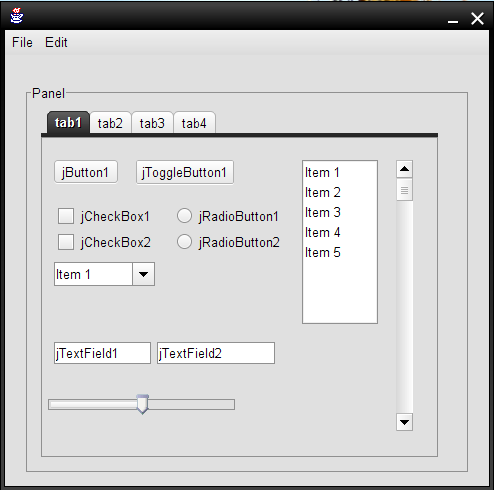 How to use JCheckBox in netbeans..